Spain, Mexico, Canada, Pakistan, Philippines & United States are where most visitors come from. Topics: Reprints, Temporary Start/stop, & S-t On Kindle. Age: It went live on May 22nd 1998, making it over 19 years, 10 months old. The site has about 29,250 users daily, viewing on average 1.94 pages each. It is hosted by Ntt America Inc (New York, New York City,) using Apache web server. 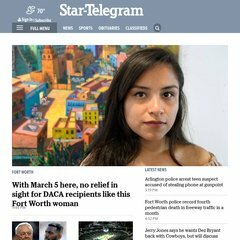 Star-telegram.com's server IP number is 165.254.27.73. ns1.nandomedia.com, ns3.nandomedia.com, & ns4.nandomedia.com are some of its 4 Nameservers. PING a1650.b.akamai.net (63.80.4.11) 56(84) bytes of data. A ping to the server is timed at 102 ms, and the average page load time is 1828 milliseconds.